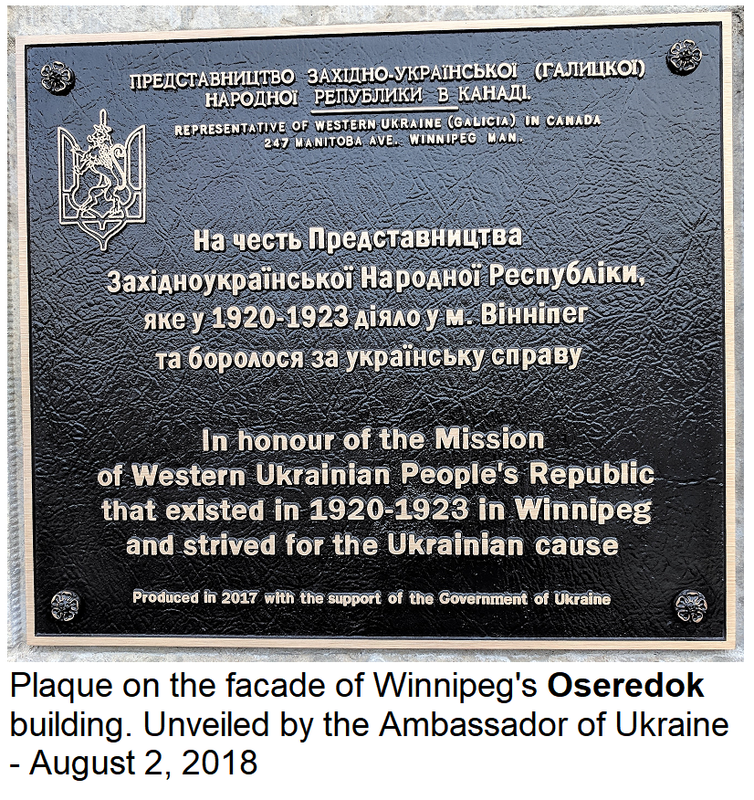 A UKRAINIAN EMBASSY IN WINNIPEG!? 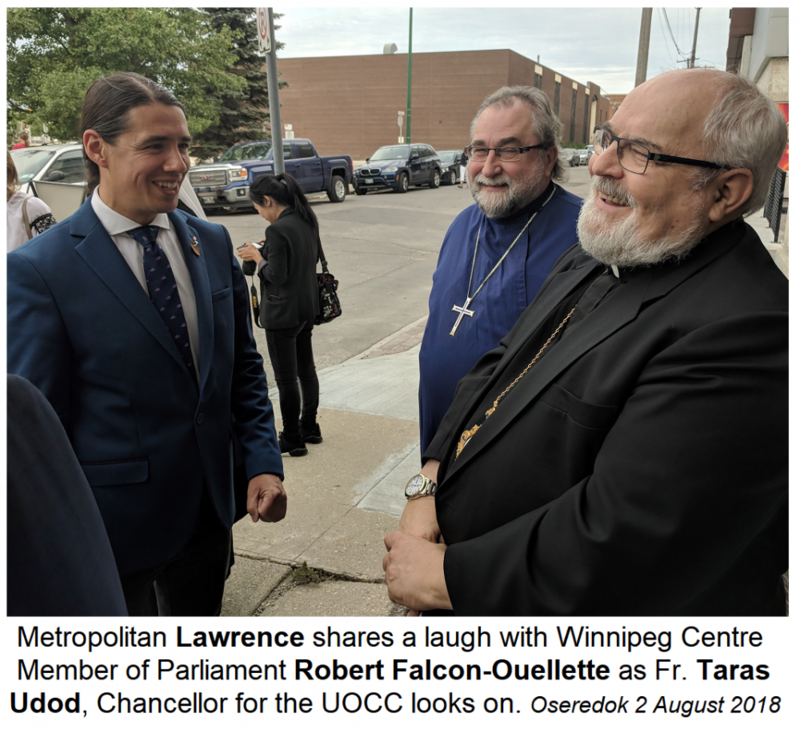 His Grace, Metropolitan Lawrence was invited to participate in a special event at Winnipeg's Ukrainian Cultural and Educational Centre Oseredok on Thursday evening 2 August. 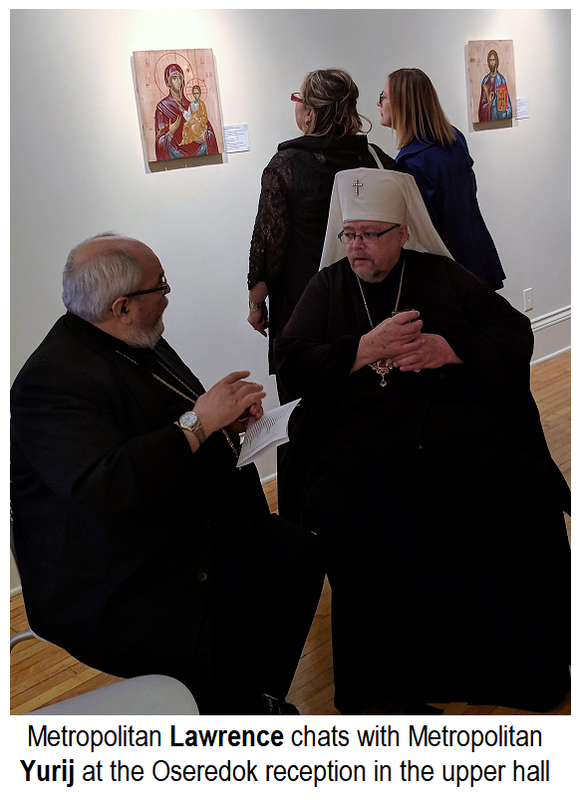 Among the many other dignitaries, were Metropolitan Yurij, Ukraine's Ambassador to Canada Andriy Shevchenko and a number of politicians and community leaders. 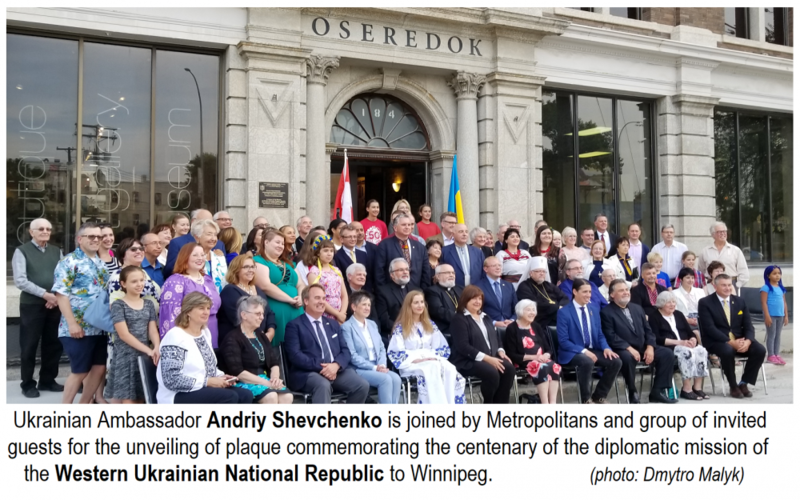 The event was a ceremony to unveil a plaque to commemorate a very special historical reality that would probably surprise many citizens of Winnipeg whether or not they are of Ukrainian heritage. People who know something of their history of Ukraine, know that there were a few times when the Ukrainian people actually declared independence. One of those moments occurred in the wake of the First World War. Beginning in 1917, the Ukrainians in the eastern regions began emerging from the political system of Tsarist and then Bolshevik Russia. Both systems wanted to control and ultimately suppress Ukrainian self-determination so the Ukrainian leaders naturally declared independence. They established a Ukrainian National Republic. In 1918 the Ukrainians in the western territories of Ukraine declared independence on November 1st. They called their territory and government the Western Ukrainian National Republic that basically covered the area then know as "Galicia". Within a year, both republics managed to join as one. Well, alas, these short-lived attempts at establishing a free and sovereign country in the modern sense did not have the wherewithal nor did they receive the support external support that they would need. The whole world was coming out of a devastating war and even those nations that wanted to support were limited in what they could do as they were rebuilding their own countries. However, in spite of the aggression from the immediately neighbouring countries that wanted to carve off pieces of Ukrainian rich lands for their own political and economic gain, a number of other nations were very sympathetic and morally supportive of Ukrainian independence. Those early Ukrainian Republics were able to establish diplomatic ties with a number of nations. A surprising number of Eastern and Western countries recognized the Ukrainian Republics and their declarations of independence - including Germany, Bulgaria, Denmark and Persia. Even Russia and Poland recognized the new states initially. The new Republics sent emissaries as formal delegations to countries all over the world trying to garner much needed material and moral support. With some of them, they actually established formal diplomatic missions! One of those missions was established in Winnipeg, Canada. The mission functioned in Winnipeg - with its office on Manitoba Avenue - for three years, from 1920 to 1923. Many historians agree that, although the aspirations for an independent Ukraine were not realized at that time, such diplomatic efforts planted the seeds that put Ukraine on the map for many western peoples that until then knew little about the centuries old Ukrainian culture, language and people. It is truly tragic that since the mission had to close in 1923, millions upon millions of Ukrainians suffered and died under the heartless, genocidal oppression of the Soviet regime. We can only pray that when we learn of a people (or an individual) that is appealing for help and support, that we will really listen and understand their plight and their hope and see if maybe we can do something. 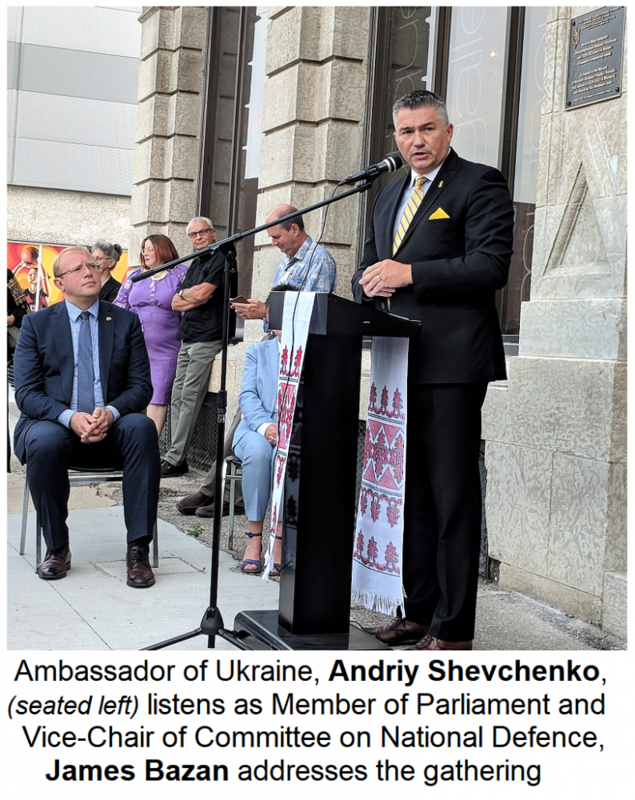 The present Ambassador of Ukraine to Canada, Andriy Shevchenko, in his address to those gathered, gave a fascinating history of the 1920s Mission and the diplomats associated with it. A number of politicians were present and brought greeting on behalf of the federal and provincial governments and from themselves. Members of Parliament MaryAnne Mihaychuk (Kildonan); Robert Falcon-Ouellette (Winnipeg Centre) and James Bezan (Selkirk) brought greetings and messages, as did the Members of Manitoba's Legislative Assembly Blaire Yakimoski (Transcona) and Dougald Lamont (St Boniface). 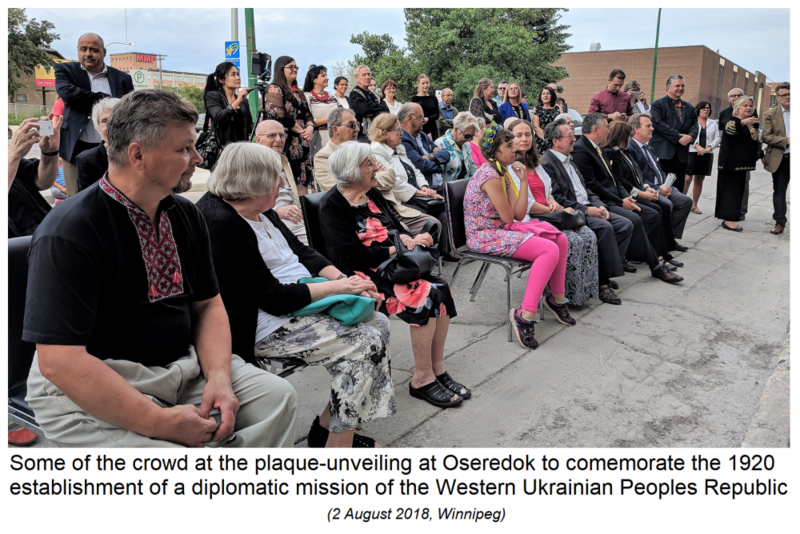 Presentations were made by the President of the Manitoba Provincial Council of the Ukrainian Canadian Congress, Joan Lewandoski-Kuzia, and the President of the Oseredok Board of Directors, Martha I. Chuchman. 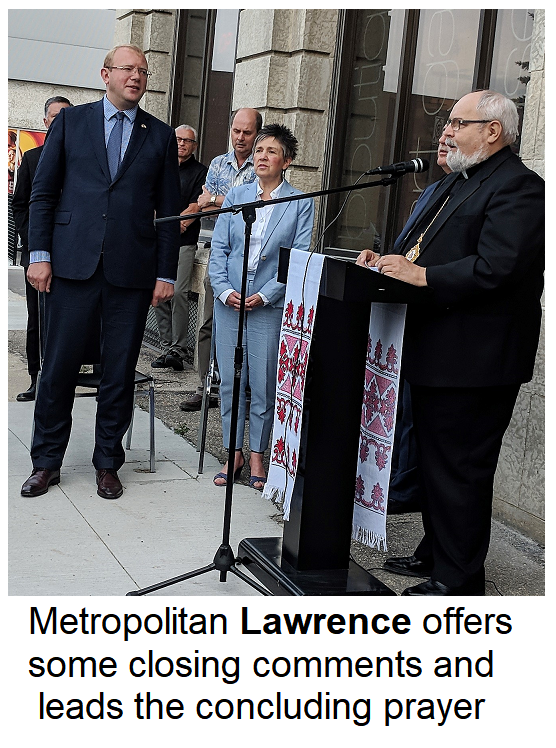 Metropolitan Yurij of the Ukrainian Orthodox Church of Canada, assisted by the Chancellor Fr. Taras Udod, opened the evening with a prayer and blessing. Metropolitan Lawrence of the Ukrainian Catholic Church in Canada closed the evening with a prayer and then led a singing of Mnohaya Lita that everyone happily joined in.